Who are the best teams in your state who didn't get to go to worlds? Here are the teams that qualified for worlds from our state. I’m from 7701x and compete at central/northern Indiana competitions. I’d say our region is fairly difficult with 20ish teams that are well qualified to go to worlds but our state only has 11 or something high school spots. During qualifiers, we lost twice because we had two partners who disconnected. During Skills, a ball got stuck during a good driver’s run and our programming failed all 3 times even though it worked on our field at school, we would have got a 50-52 skills if it went to plan. 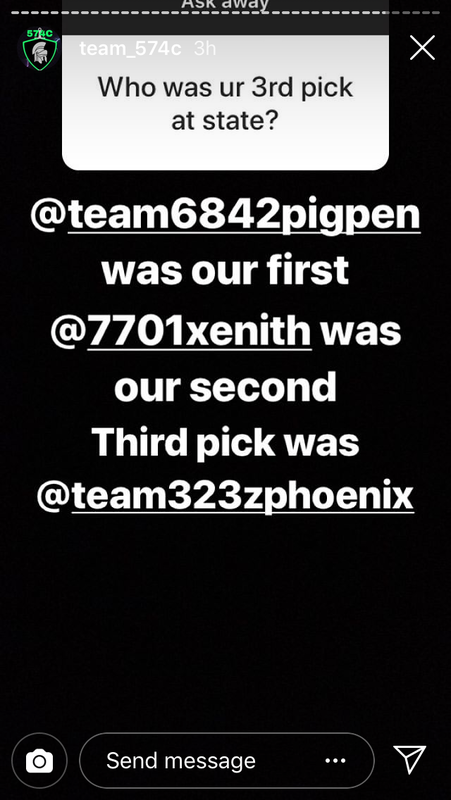 During picking ceremony, 1st-3rd seat didn’t pick 6842z(PigPen) or Us. Every state-qualifying competition PigPen won or did amazing AND they have been one of the top teams in our state for every year since nothing but net so they are extremely well known. We, on the other hand, are a newer team but we won the 2 tourneys out 2 tourneys in February before states and beating PigPen at JAGS. 4th seed was 574c (#1 skills in the world rn) and their picking list was 6842z(PigPen) then 7701x (me) then 323z. 1st seed (491x) picked 491a, which makes sense, 2nd (99904a) picked 574D, which there are better options, and 3rd (121x) picked 1115b, which is why? We won the two tourneys with 1115b and 121x probably were trying to strategically split up the combos, like 574c and 574d or 1115b and 7701x, but you can’t counter pick against 574c because they’re good with any above-average bot. counterpicking 1115b against us was a weird choice because we can 1v1 pretty much anyone on flags as long as our partner’s defense is good, 1115b’s amazing defensive ability isn’t limited to 1115b though. furthermore it would have made more sense for 1115b to decline since they we’re in 7th place in ranked and could have picked us or literally anyone else because we beat 121x 30-3 in the finals of the previous tourney. Durring R16 #6-1, we controlled flags except for one low flag but our partner was busy driving circles in the backfield trying to defend a cap-bot. it was going in our favor until our opponents got super lucky and fluked a double park and won by one point. During QF #1-1, a blue robot got stuck for a minute, then a red bot entangled a blue robot for 24 seconds a lit bit into the driver control getting free with about a minute left. I’d argue that wasn’t match effecting and red would have won 20 to 12 but red got dequeued. the match was huge yikes and even if it was replayed, i still think red would have won. if red won, we would have qualified for worlds through double qualification. 97834B. No, I’m kidding, that’s my team. We did not do good at state. 1814D needed to go to Worlds (I know, not my state. But still.). Ohio has a stupid amount of spots, but 6741E didn’t get to go, and that’s kind of disappointing to both me and them. I mean- 7830P was a push bot that just had a good driver; they did not have another scoring component other than a rubber band intake. I do agree with you, however, on Sprocket Sisters-they’re a really good team. I am not saying this because they carried us at Higley HS, but because they’re actually good. Well, 6142W and 6142X are really good teams- 7830P just messed up their planned alliance at AZ MS States. 109A was the one team that should have gone to worlds through states. 586A, 586B and 6210z also got in, making it not 16 but 20. 974c dominated Colorado all year. They had a bot that could go with the best of them. Team 20002A from Texas is extremely competitive, probably the 1st or 2nd best in the region. The only problem was that they got the bad-end of the V5 system. Their robot disconnects literally every competition and despite that they have been 1st or 2nd seed. Because of extremely long V5 disconnects up to 20+ seconds, they have lost finals almost every single time at competitions. During states is when they realized that their stupid system got to them. I knew that they would likely have disconnects at the event, so before the event I tried offering as many replacements I could afford to them; new battery wires, replacing the VEXNet key 's wire, etc. to see if it would be possible to prevent it from happening. As competition went up they required less disconnects, but the fact that they were still disconnecting they lost quals more than they should. Since they got the unlucky end of the V5 system, they didn’t qualify for worlds despite all mine and their efforts to prevent disconnects. Team 400D is a really good team from Galveston, with the member in their senior year. Although they did well during the majority of the competitions they had way too many hiccups at Texas State. I won a tournament with 400D in previous events and their robot really should’ve qualified during states. I think my team, 8685X, could be a contender for that title in my state, not to sound egotistical or anything. Only puncher with an angler there and I had the opportunity to make it in off of skills and tournament champion but I blew both of them. 4th place in skills cause I choked a 21 point driver because I failed to park which would have put me in 1st by a point and I didn’t get my previous best of 19 which would have put me in 3rd. The top 3 skills scores got invited to Worlds. Then I finished 6th in quals because of a suspected throwing/big choke from my teammate resulting in a loss then a tie that was my fault for missing so many shots. Got selected by the 2nd when I had an alliance set up with the 4th and I should have declined because the 2nd really did not deserve it, I was basically 1v2ing. Then we lost in semis by 4 cause my intake broke, I could It was all my fault too, I can’t blame VEX or that team for being 2nd, I can’t blame Bo1. I could’ve and should’ve declined and chose myself, I shouldn’t have choked on skills or in that match, I should’ve built a better intake, I shouldn’t have helped my Y team code and let them copy my bot (they finished 3rd in skills). I can’t blame my teammate, it was his first year and he tried his best too. I can only blame myself. It was a learning experience though and I can’t wait for next season. The tournament champions of State was two teams I beat in finals 2 weeks prior by quite a bit too. Kinda stings a little, not gonna lie. I’ll still be at Worlds helping out though, be it volunteering or helping teams out. I’m disappointed 6741E didn’t get to Worlds, tbh. I personally think that 37409B could have gotten to worlds. Their robot had been doing great the entire season until state and then they just had so many problems with it. It didn’t do well at state, however it definitely could have been a qualifier for worlds if the robot hadn’t broken down. 4142A had a nice 2BC and tailed 4142B in performance all throughout the season. 52351A was one of the 6 top teams in AZ and ranked 7th in Green Division at Nationals. At state two of the six got split from being on an alliance together (BO3 has nothing on Q-schedule luck). The other team made it to worlds via skill rank when skill champ also won state.